The final four pools for the year, bringing the total to 28 (4 ahead of target). Above is Kiama South ocean pool, looking up the coast. Click (and re-click too) the image to see the full beauty of this magical spot. Following on from my previous post (where I met up with fellow-pool-conquering-hero, Simon), this day was a two pool day. Warilla in the morning and this beauty after lunch. Then a mad race back up the freeway to Sydney in time to collect the kids by 3pm. 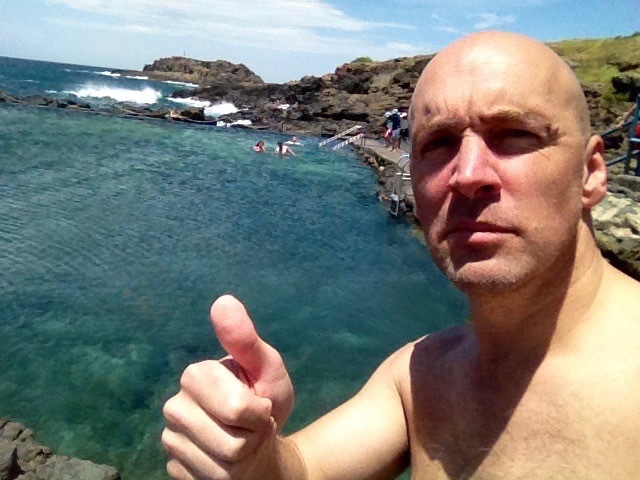 As you’d know from my prior post, Kiama has two ocean pools. This one sits out on the headland and was immensely popular on the blustery day I was there. The water, for some reason, was cold. It took me half a dozen laps before I could feel my arms. It’s got spectacular views up the coast too. The week around Christmas in 2015 was cold and wet. Bad for runners and cyclists and golfers (not a sport, of course) and koala trappers and parents with three children inside for days on end. Groan. But, naturally, not for swimmers. So, I made my excuses and hopped in the Kia Sorrento and went for a drive. Solo. Stockton sits on the spit north of Newcastle Harbour in a very exposed position. It was raining with a biting northerly wind the day I arrived (note the flags in the photo; the ripples too). How many people did I have to share a lane with, do you think? How many families frolicking in the frigid rain? Yep – not a soul. It was bleak. But it’s conquered now and the very nice lifeguard (warmly dressed in her winter fleece) charged my phone for me so I could take the requisite selfie. It’s still raining. Two days after I swam Stockton. What to do on this dire wet Christmas break? How about pop all the family (including the inlaws) into the Kia and go for a drive through the nearby coal-mining country towns? My family are long-suffering but frankly we were going too stir-crazy to stay at home and watch the rain for another day. Why not watch the deluge from inside the car? And so we drove to Maitland where the kids joined me for a swim (until they turned blue and started asking for chips). This is a fabulous pool surrounded by a beautiful, historic park. It’s born a few Olympians too. And you can watch the coal trains passing. The family have had enough. It’s properly raining now. We drive south from Maitland (see post above) through Kurri Kurri (which has a 25m indoor pool, but I’m saving that for one winter – got be strategic about these things) to Cessnock. It’s a public holiday in a coal-mining town that’s not exactly big on museums and galleries and it’s pouring rain. We eat in a very nice, dog-friendly, pub and I ask the waitress how one can fill in the time in wonderful Cessnock. ‘You’re doing it,’ she said. It was touch and go really with this pool. Clearly I wanted to get it done and over with – I have no plans to return to Cessnock any time soon – but asking the family to sit on the Kia Sorrento’s well-upholstered seats for half an hour and entertain themselves while I carved up the laps ‘el solo’ was something even someone as self-obsessed as I would find hard to do. Fortunately, my glass-half-full inlaws insisted I do it. ‘We’ll go to McDonalds and wait for you there,’ they said. And so they did. And so I swam. And Cessnock – just me all alone again in the pool – was conquered. In this selfie you can see the glorious McDonald’s arches in the background where my family were gorging on high-fructose corn syrup and trans-fats whilst I swam my last pool for 2015. P.S. I must say, my derisive comments about Cessnock aside, the lifeguard at this pool was a great bloke. We had a loooong chat (he’d had no one to speak to all day). He’d painted the stands himself in the local school sport team colours numerous times over the years.